The calendar asserts that summer is dwindling, but I know better. Damp air, flat, steely skies until late in the morning and an urge to put on a sweater are only teasers of what will come much later here than most other places in the country. Usually, I allow myself to be lulled into remembering all that I love about Fall weather after having had weeks of heat and humidity, but not this year. No, I’ve enjoyed the blue skies and temperate weather — pleasant breezes that keep the house cool and the pots on our patio from needing constant watering. I haven’t had my fill yet, but know by the time September has passed, I’ll be ready. It’s usually our warmest month, only once every blue moon or so bringing blustery showers and a thunderstorm. But it’s been years since we’ve seen that. So for now, a bowl of soup is fine. Something bright and full of flavor, but not packed with calories. 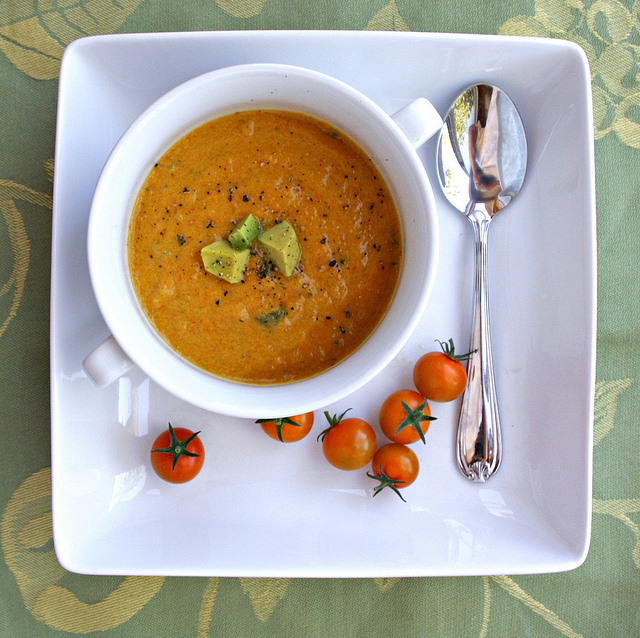 Take advantage of all the beautiful sweet peppers at the market right now — or if you’re lucky enough to grow them yourself — and try this roasted sweet pepper soup. If you’re thinking it’s still not quite soup weather yet, then freeze it. It’s worth waiting for. 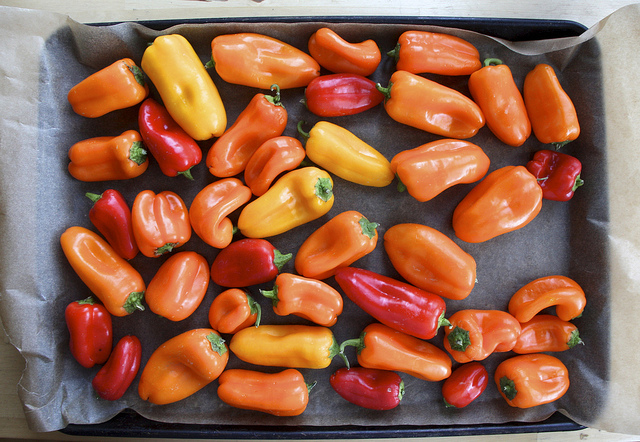 Place whole peppers on a baking pan about 6″ under the broiler. Allow the skins to blacken before turning them to blacken the other side. Remove the pan from the oven and cover with a clean dish cloth. Allow to sit for 15-20 minutes, or until peppers are completely cool. Peel blackened skins from the peppers, remove membranes, stems, and seeds. Do not rinse! Coarsely chop the peppers and set aside. Heat olive oil in a medium sauce pan over medium low heat, then add the onion and garlic and saute until transparent. Add the roasted peppers and stir to combine. Sprinkle the flour over the mixture and toss lightly, cooking for 2 minutes, but avoid browning. 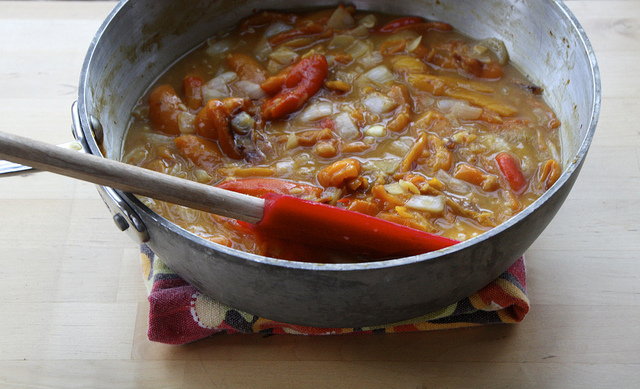 Stir in the vegetable stock and raise the heat to allow the mixture to come to a boil. Reduce the heat to low and allow to simmer for 20 minutes. 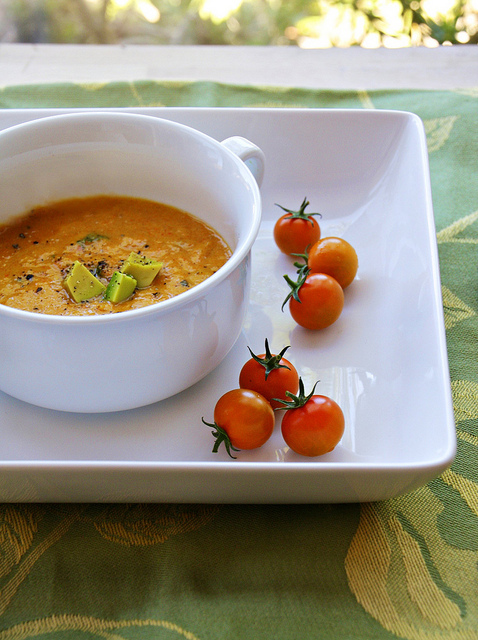 In a food processor, blender, or with an immersion blender, carefully puree the hot mixture until smooth. Add the cilantro and blend well. Return to the sauce pan, stir in the milk and yogurt, and allow to gently reheat. Many thanks to Eileen who noticed I’d forgotten to show where the peppers are added in the directions. Just a tiny oversight! I’ve been making this soup for years, tweaking it here and there depending on what I have on hand. The original recipe contained heavy cream, and I just can’t see doing that to a great vegetable soup. The yogurt is a perfect addition because it provides a pleasant tartness that works quite well with the roasted pepper flavor. 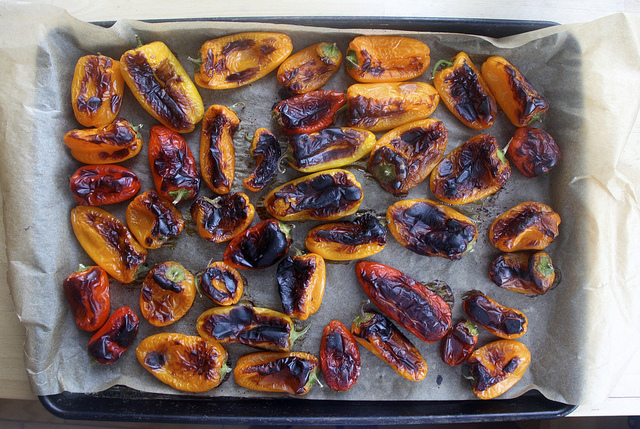 Roasting peppers can be a smelly process, but we love the smell. Regardless, I always turn on my exhaust fan when I’m roasting them just to make sure the smell doesn’t end up in our bedrooms! I couldn’t pass up the bag of cute mini sweet peppers for less than $4.00, but trust me — what a royal pain to peel. Turn on HDTV, stand at the counter with a nice beverage and just don’t think about it. You’ll be done before you know it. Sometimes I roast green chilies with the sweet peppers and goodness they’re good! Roasted onions work well, too, if you want a sweeter mix. 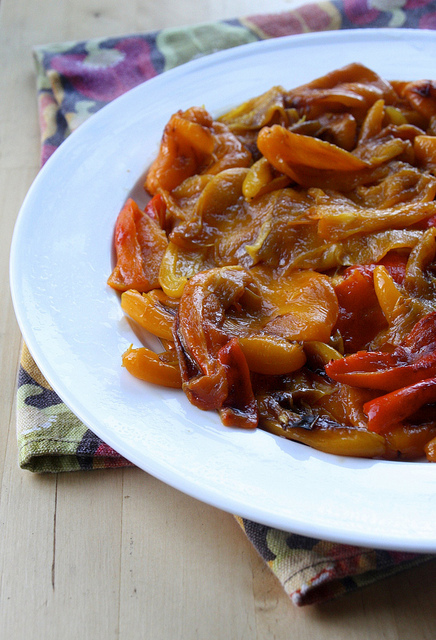 You can prepare the roasted sweet peppers a day ahead if you need to. Just wrap them well and keep them in the fridge. If you’re going to prepare the soup ahead, then allow the finished soup to cool completely before covering it and either storing for a few days in the fridge, or better, freezing to enjoy on a blustery day. Sweet peppers make me think of summer, so soup weather or not, this hits the spot.